house projects | What did she do today? Spring farm work has begun! I took down the growing pen for the chickens by myself, so I can move it somewhere other than under my bedroom window. That was a bad idea, since they start crowing long before they are ready for butchering. The upside to that location was the ease in which I could monitor the structure. I was able to shoot a raccoon from the living room window, when it was trying to get in. I’m trying to figure out where I can locate them this year that will allow us to keep them safe, but not so close they wake me up. I am planning on planting some sort of ground cover where the growing pen used to be. Maybe wheat or rye, maybe clover. Not sure. I want something green, and pretty, but useful for fodder. I will be putting housing for the baby rabbits in that area. I did another round of rabbit breeding today. A new doe, who has yet to be named, but might be annabelle…not sure, was bred to Guy (pronounced Gee, he came from my friends rabbitry where all the rabbits are given French names). Josie, who was not pregnant, but should have kindled this weekend, was bred to Almanzo, and I tried breeding the new doe’s sister to Charleston but she wouldn’t breed with him, Henry, or Guy. Maybelle lost a baby bunny. That means she has 4. I have no idea what happened as it was big and chubby and they all seemed so healthy, but things happen, and there isn’t always an answer. Last year I started a project, that I never took the time to figure out how to finish, but today I got a good deal more done. That was the plumbing for the outdoor utility sink. I got a great faucet for only $3.00 at a yard sale, but it’s inner gaskets needed to be replaced. I did that, for only a couple dollars, and reassembled everything, and it works! I still need to put in the drain pipe so that it will drain into the dry well we dug last fall. I picked up a stopper for the sink, so now I can do all the washing of the animal items outside! 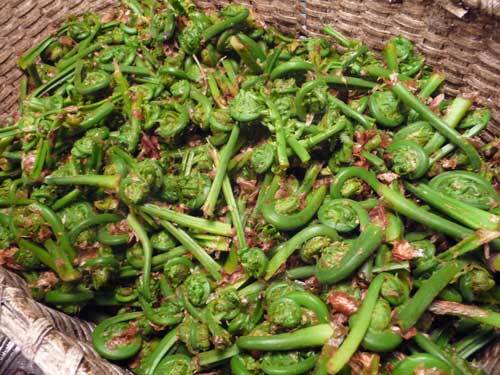 The daylight hours ended with me picking fiddleheads in the back yard! 6 pounds of them. I hope we like eating them, because there are plenty more where that came from. I love foraging. It’s a really neat way to get your food. It gives you time in nature, which is very relaxing, it’s free and who doens’t like free food, and it gives you fresh and healthy food. I really enjoy learning what I’m looking at too. It got to the point that I could tell by the way the leaves were bulging that a little patch of fiddleheads were just under the surface. I found one section where the fiddleheads are smaller and thinner, and one section where they are taller, thicker and more robust. I’m interested to see which are yummier. 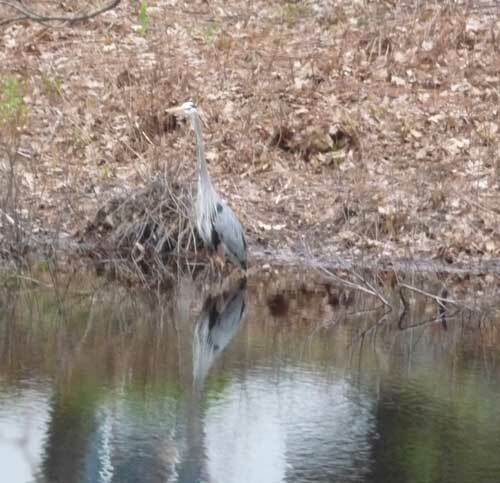 Oh, and Random beauty in my back yard…there is a swampy part of a tributary that runs into the Isinglass River, behind my house, and in that swampy area is a beautiful Blue Heron that calls it home. I saw the bird sitting on a rock in the middle of the river, but when I pulled over to take a picture it moved over to the more secluded area in the weeds. I watched it for a while and got a couple of ok pictures. It really is a marvelous bird, and so majestic when it takes off in flight. 2008 was my start on becoming more self sufficient. Less dependent on the industrial food system, and the mall, is where I started. I feel good about our progress. I had my first vegetable garden this year. We were quite successful and learned a lot. I LOVE tomatoes fresh from the garden. 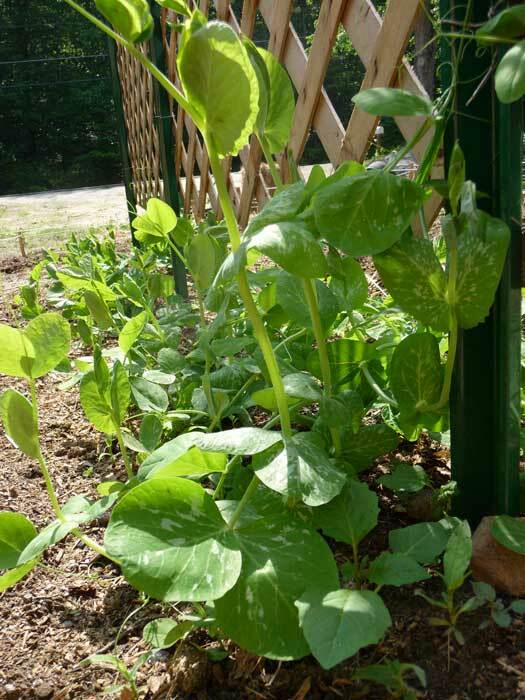 Fresh green beans taste nothing like frozen, canned, or even beans from the market. Carrots left to be hit by a good frost (or frozen into the ground, even) are the sweetest, most delicious I’ve ever encountered. 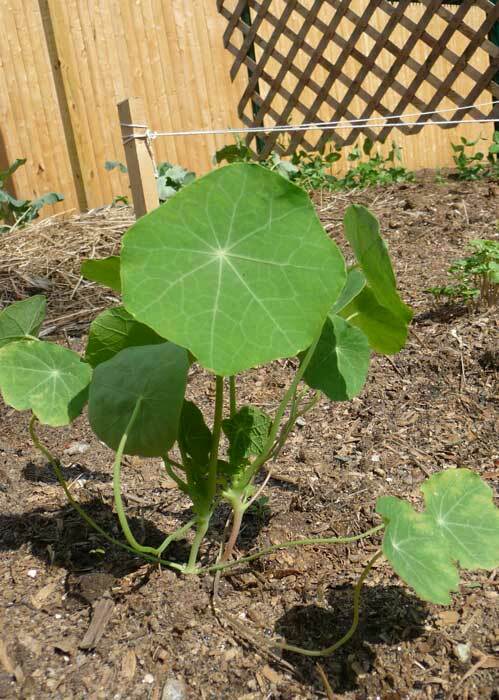 You need to be very diligent with the squash seedlings, for it you don’t have them properly labeled you will not know what is what until they grow fruit…is that a Zucchini plant, a Pumpkin or a Butternut? Tomatoes really need substantial supports, little bamboo sticks are not enough, even thought they are cute. 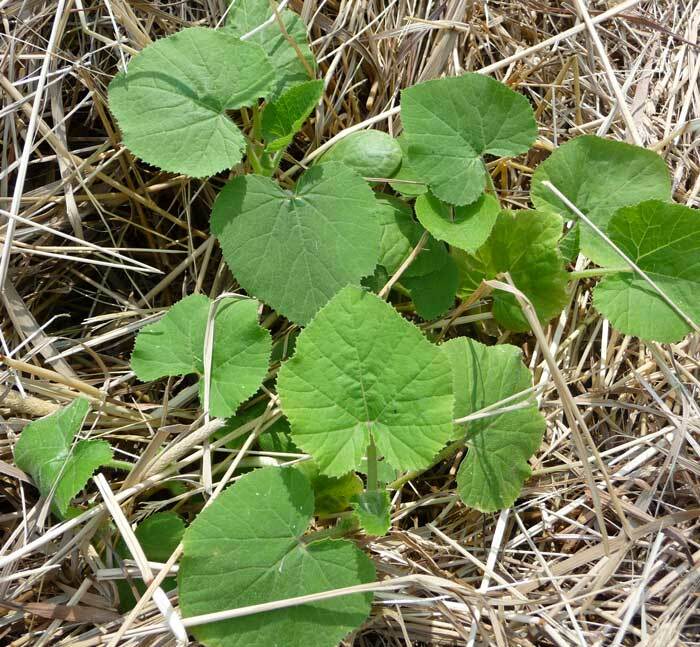 Root veggies need softer soil, with a little sand in there so they go deep and don’t just grow fat, and potato tires do not work well with hay and a rainy spring, nor do they work well with freshly fertilized soil. We learned more, but that was a good recap. We also started raising a flock of chickens. I never knew how fun those little critters are to have around. They are very amusing, low maintenance and quite friendly. We are up to 8-9 eggs a day, enough for our family and my parents, right from the back yard. This year we built a coop and a makeshift run that needs to be taken to the next level in the Spring. I started my journey of putting up food. Canning and freezing specifically. I did a lot of borrowing of supplies, having never done this before. I stuck to tomatoes and peaches for the most part. I’ve had some very yummy meals made with those jars of tomatoes. What a treat to have canned peaches with our oatmeal from time to time. Enjoying blueberry pancakes and an occasional bowl of blueberry rice pudding with frozen berries we collected for free from the plants near our house. I meant to pull out a bag of frozen homemade cider for Christmas, and forgot, but that’s okay, we have all winter to enjoy the 3-4 gallons we have in there. Lots of crafting took place in 2008. I think the items I’m most fond of are the Sweater Vest completed on the last day of the year, which is drying so has yet to be photographed. Using my craft to help others is something I tried my hand at this year, with coordinating the Knitting to Keep Warm event at my Local Yarn Store. This is something I’d liked to do more of next year, both with coordinating events for others to get involved with, and doing things on my own to donate to those who need them. I’ve taken cooking and baking more seriously this year. Our life circumstances never had us eating home cooked meals, cooked by me at least. We worked in a group home where we had a cook. We ate out a lot. Then we moved to the country and had a baby. Well, 2008 was the year to learn how to cook at home. It’s gone pretty well, and I’m looking forward to diving deeper in 2009. We entered the year of 2 with our daughter. She has been a lot of fun, lots of talking, puzzle making, reading and coloring. She helps daddy make breakfast, and is a fabulous chicken farmer. She is creative and needs little stimulation from us or her toys, to play happily, but enjoys time with her parents and likes to help with the sewing machine. Looking back on 2008 I am pleased to say I enjoyed this year. It has been a year of reevaluation, change and new adventures, all of which, while challenging, have definitely enriched our lives. Thank you for being here, reading, commenting and taking the journey of 2008 with us! Having a garden again this year. It’s being expanded to the piece of land that lies at the other end of my property. We’ve tilled, and will be planting a large tomato crop. We did buy a lot of tomatoes this year, and we don’t want to have to do that, so we know we need to plant more. 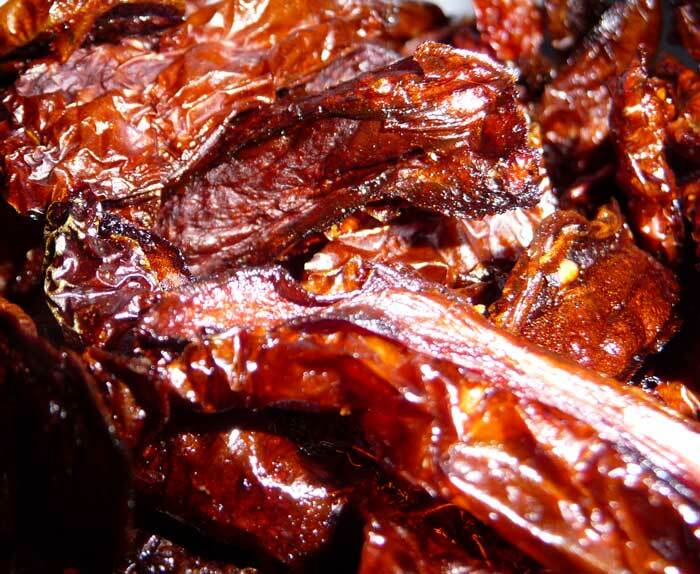 Lots of Roma and sauce style for sure. Dad and Mini will be looking for the Sun Globe sweetness of those beautiful orange cherry tomatoes, and of course some nice big cutting tomatoes for sandwiches and salads. The seed catalogs have arrived so January will be spent pouring over those and deciding what to buy again this year, and what to try for the first time. Chickens! We have decided, with the help of our local heirloom chicken farmers to expand our poultry focus. We will be raising some chickens for meat purposes, along with maintaining and probably adding to our egg layers. We enjoy eating chicken, and while we are fortunate to be able to buy chicken from local raisers, we feel the cost and experience of raising our own will make sense. We are also going to be trying our hand at a half dozen turkeys, Narragansett breed, the old New England Turkey, to be shared with my parents, and a couple ducks. Duck eggs are great for baking, very rich and delicious to eat on their own, and we think it would be fun to have a couple ducks wandering about, eating slugs out of our garden. We are looking at the beautiful Blue Cayuga. Lots of crafting! I look forward to incorporating mini into more of my crafting now that she is able to follow directions and understand what we are doing. She bakes and has become a fabulous egg shell puller (Husband cracks she pulls them apart), and is quite proficient with a whisk. Clothing is a big focus in my crafting. I don’t tend to get into a lot of crafts for crafts sake, but rather am looking for crafts that are fun to make and fun to use later. Kitchen items like potholders, and an occasional pin cushion are about as “frivolous” as I tend to get. Though I won’t say never. I have plans for some exciting sewing projects, both to create from patterns and to create from scratch. I love to see my family members enjoying comfortable clothes I’ve made. I also enjoy being able to put on an outfit in the morning knowing that most, or all, of it was made by me. It’s just a fun feeling. Knitting has become my favorite crafting endeavor so there will be lots more of that. Especially baby knitting! The most exciting plan of 2009 is that we will be welcoming our second baby girl into this world. I am 6 1/2 months into a very smooth sailing pregnancy, due in March! Mini is excited to be a big sister and kisses her good night and talks to her through my belly every night. We have not had to do a lot to prepare this time, so it seems it’s flown by. We have most everything we need, as we kept all of mini’s clothes (all the garments I sewed and knit will have a new life) and toys, car seat, co-sleeping crib, breast pump and the like. But the baby does need her own hand knits, so the purchases I made yesterday are, in large part, for her. I want to focus this year on contentment. I have found myself content far more of the time, than ever before in my life. It’s a feeling I enjoy and one I want to foster all the more. I’m going to be sharing my journey in that area, as well. Contentment seems to be a mindset, one where even though there is more to have or experience, what you have is enough and you are satisfied. I want to enjoy what I have, personally, relationally and materially, rather than worrying about what else I could have. I hope 2009 provides pleasures and contentment for my family and yours. Getting organized. I’ve been very disorganized lately, much more focused on doing things than cleaning up after the doing…instead just jumping on to the next thing. I still had canning supplies cluttering the laundry room, and we have to do the sorting of the toys and determine what should go and what should stay so there is room for the new items, and my bedroom looks like a bomb went off…to say nothing for the clothes I didn’t want to deal with so threw in my soaking tub for later! It’s a great hiding place since it surrounded by curtains and is so big…I know, pathetic and lame. I was able to organize the mud/laundry room. Put away all the canning supplies, including the new canning goodies I got for Christmas!! My in-laws got me all outfitted for next year. I shouldn’t need to borrow anything…unlike this year when I borrowed everything except jar lids which I bought. I have a new 23 quart pressure canner, water bath canning bucket, jar lifter, metal funnel, and LID LIFTER!! I’m so excited to have a way to pick up those lids without burning my fingers next year. I also received the book, “Putting food by” and will be reading that from cover to cover, before the middle of the summer, so I know better what I’m doing, and why, next year. So all that has been put away, as have all the garden supplies. There is now room to drag out the drying racks, which is great since it’s really been too cold and unpredictable to hang the laundry out lately. 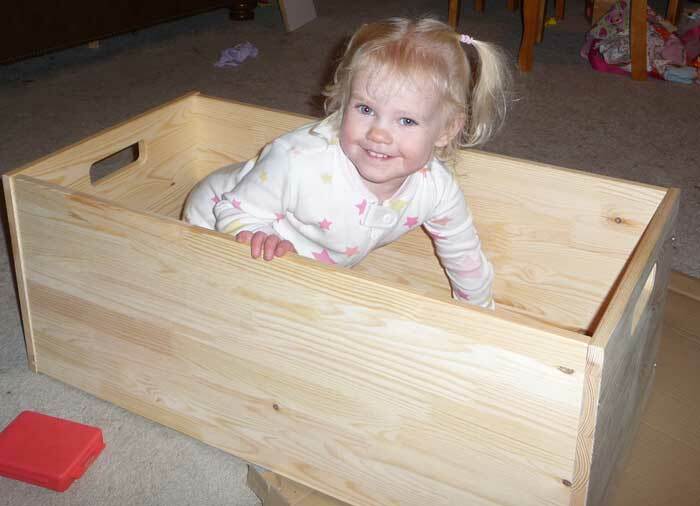 Husband and Mini made another toy box today so we can get that stuff organized. She really doesn’t have a lot to weed out as we try to purchase toys that will grow with her so we can buy less and have it last longer. I’m pleased that has actually been the case. Stuffed animals are our biggest problem. It seems they multiply in their bin! I have been working on the Mangyle and a new sweater for Mini today. I cast on Mini’s sweater last night when we went to see “The Day the Earth Stood Still”. It was surprisingly flat, and uninspiring. The director also did “The Exorcism of Emily Rose”, which was compelling on all levels, so we were very excited to hear he was directing this film. He wrote Excorcism and did not write the Earth Stood Still, so that might explain the stark contrast. There was an adorable little boy whose mom had died when he was a baby, his father died recently, was about to lose his only remaining caregiver, his stepmom who loved him very much, and I didn’t care. Not one bit. How does that happen? It’s too bad, as the special effects were delightful, but the only thing the film had going for it, really. Glad I knit. 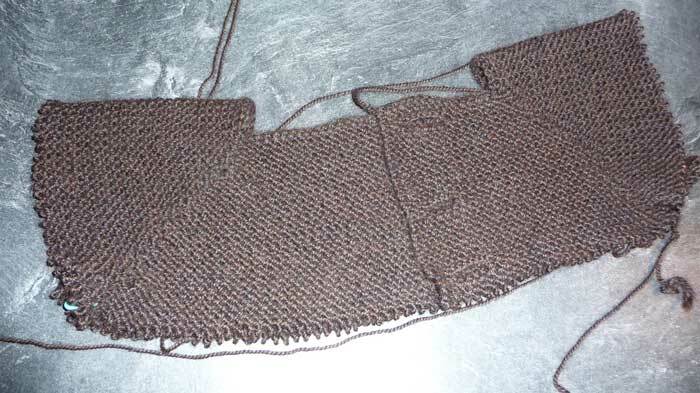 I got a good start on the sweater, worked on it a bit today and am a couple inches away from splitting for the arms. It’s going to look fabulous with her Christmas socks. Mom is working on mittens from the same yarn. She has one almost done and she just started today. Pretty impressive for my mom’s knitting attention span…in case you remember the sweater I reposessed..
Our town library has a neat little gizmo available for residents to borrow. It determines how much electricity is used by the appliance or item that is plugged into it. I used it to determine that leaving my toaster plugged in, not being used, for a whole year will cost a little over $55.00. I’m going to check other times that are likely to have a great impact like computers and such, but still, saving $55.00 by unplugging the toaster when not in use, seems quite worth it. I decided to plug a simple string of small christmas lights into the gizmo, and I determined that they will cost about $.01 an hour to run. Seems reasonable for the amount of enjoyment derived from them. This piece of information spurred me on to decorate the tree. By now you may have figured out that I tend to over think things…well I don’t know if “over think” is the right term, as it seems like such a negative quality…I guess I just think a lot about things. Well, tree decorating is not immune from this deep thought. Do I go with a matchy matchy tree of big bows, and ornaments in a couple colors? Well, I went somewhere in the middle. I have been hanging the ornaments from the advent journey on the bare tree since I had not determined what to do with them. I liked the look. So I decided Red, Silver and white on the green tree would be fabulous. I was freed up by the electrical gizmo to use the lights, so small clear lights, red garland from Ten Thousand Villages, Silver balls I bought on clearance a few years back, silver snow flake garland and ornaments collected and received as gifts, and the handmade advent journey ornaments. I’m still figuring out the topper, but for now my husband stuck mini’s little Precious Moments angel on top, and he looks pretty cute. Oh, yesterday, Bazzar Bizarre, lots of fun! Very busy, lots of the same vendors as last year, but many new folks with great stuff, too. Some food vendors, which I don’t remember from last year, and I thought it was a nice addition. Live entertainment, a cool venue. Yes, lots of fun. Can’t say I really bought much, as I was trying to stay focused on Christmas Shopping, and didn’t find much for folks on my list. I did find many things I would like to have recieved as gifts, but I did stay focussed. A cool lamp maker. She makes the little tiki umbrellas, by hand to then create these fabulous colorful lights. I did buy a little kit to make mini origami stars. I’ll show you those tomorrow. She is very into little details, which impressed me greatly. I couldn’t find a reason to buy the light, though did think about it for a little while. “The LORD said to me, ‘They have spoken well. Moses speaking to the Isrealites when reiterating the law to them. This is cool for a couple reasons, first it is talking of Christ being the second prophet, so it’s a prophecy of Christ’s coming. Another being that the first Moses brought the Law to the people, where Christ, the second Moses, would bring Grace and fulfil the law. This fulfilment brings the relatioship between man and God full circle. This weekend was well used. Saturday was spent time with family participating in one of our holiday traditions. There is an organization called Samaritan’s Purse which, every year, organizes an amazing event. People all over the country take shoe box and fill them will necessity items and toys, to be sent to a child in an impoverished nation somewhere around the globe. My family, parents, husband and I, have been participating in this opportunity for several years. This is the first time we got to talk to Mini about what we were doing. She was surprisingly excited about buying things for someone else, and I was quite pleased to see that. We collected such things as school supplies, soap, toothbrushes, toothpaste and the like, and included some fun toys including a beaded necklace kit, some fabric with needles, pins, and thread, musical instruments, and a little candy, since that is a big hit with the kids that receive these gifts. On top is a doll that I made. I usually purchase a small stuffed animal, but felt this year I wanted to take it another step further and give more of myself, than necessarily buying everything. I hope the girls who receive these items are encouraged and see the love, that someone who doesn’t even know them, can share. If this sounds like something your family would enjoy being a part of, there are drop off locations in every state, but the dates for collection are from 11/17 through 11/24, so you have to get started right away! I’ve been wanting a table for behind the couch. I don’t like coffee tables, especially with little ones around. Not only do the little ones have a habit of grabbing things when they are down so low, but the whole concept seems dangerous for bumps and falls. But without a coffee table, where do you put your drink and the like? I’ve been using a TV tray, but they don’t look like part of the decor, and I don’t like putting them back and taking them out. 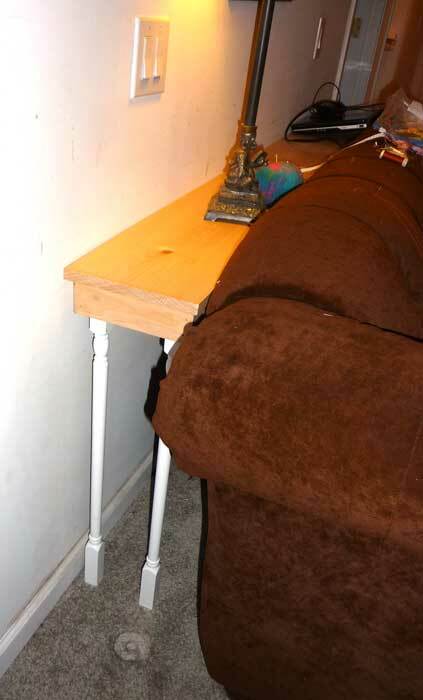 Finally, the Sofa Table would give me a place to set a nice little table lamp, which would provide more direct light when I’m working on a project, as well as use less energy than the 3 bulb overhead light in the living room. So I set out looking for a table to fulfill all my living room needs. I found a few, but the prices ranged from about $129.00 to over $200.00. Well, I’m too cheap for that, so I decided to make one. I have some paint kicking around that I might use, if not I’ll just need a quart of paint to take care of this project. Even with the paint and nails factored in, I spent less than 1/2 the cost of the least expensive option I found during my search. I’m pretty excited! I can’t wait to have it painted, but that is for another day. The scarf is coming along nicely. I’m somewhere between 1/3 and 1/2 done. 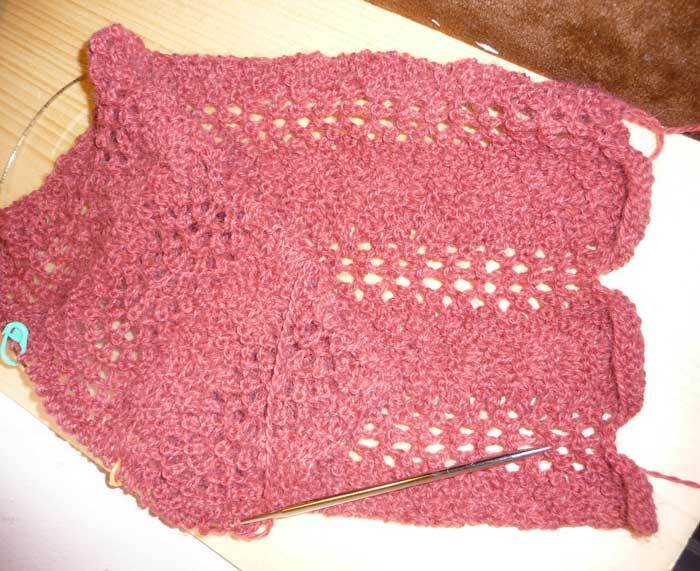 I love how it looks, and as long as I’m paying attention, any level of attention, the stitch pattern is a delight…as soon as I hit auto pilot I mess up and have to rip out several rows to get back. So I must pay better attention! 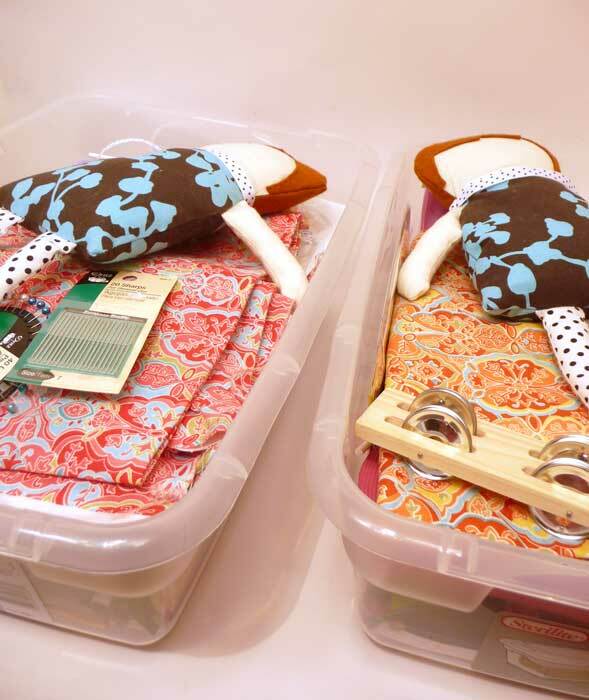 Tonight, while I completed the hand stitching on the dolls, my husband and Mini put together the great pine box we picked up at IKEA a couple weeks ago, for a mere $15.00! It’s for Mini’s toys. I was so impressed with how helpful she really was. 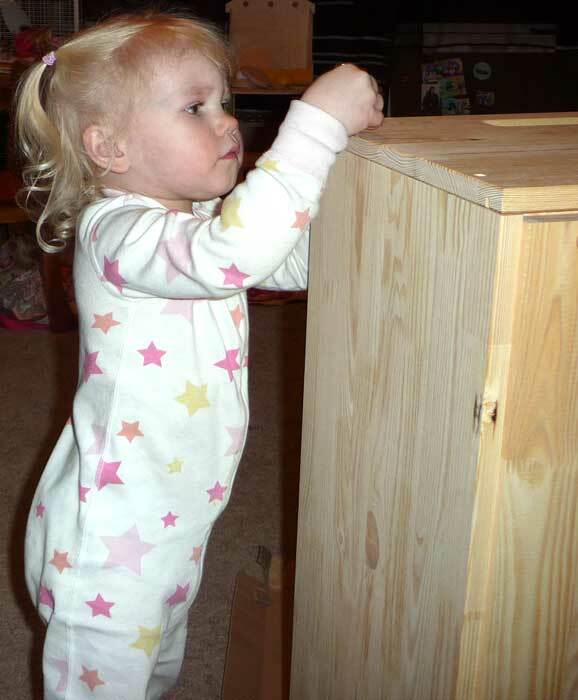 She even helped fasten the screws in place. She’s really such a remarkable gal, especially with fine motor and logic skills. I hope she takes to crafting the way I have, it will be such a fun thing to share with her. So far she seems to have enthusiasm for it, but I know that sort of thing ebbs and flows with kids. I hope you had an enjoyable weekend too! What a day! I had some successes and some failures. Needless to say, I’m a little frustrated with the later, as it constitutes a waste of time and some money, but hey, you can’t be good at everything, and I’m not…certainly my greatest weakness is my “kitchen skills”. My mom is amazing in the kitchen and while she overcooks almost every veggie she puts on the table, and can’t figure out for the life of her how to cook a steak with the broiler (both are two of the few things I do excel at), she can cook. She can take a bit of this and smidge of that, a bucket of something else, and make a really yummy meal. She doesn’t bake a lot, but she does that well, too. She made all our bread growing up, as well as pretty much everything else, from scratch. I don’t think anyone will ever know why I didn’t glean wisdom from the years of living with her, in this area. Maybe I really was such a brat that I couldn’t be bothered to learn, maybe my mom was a doer not a teacher…I’m sure it’s a case of both, but regardless, I’m not a fan of kitchen time. I love good food. Good both in the healthy and wholesome sense, but also in the Yummy sense, and sometimes I stumble along and succeed, and others, not so much. 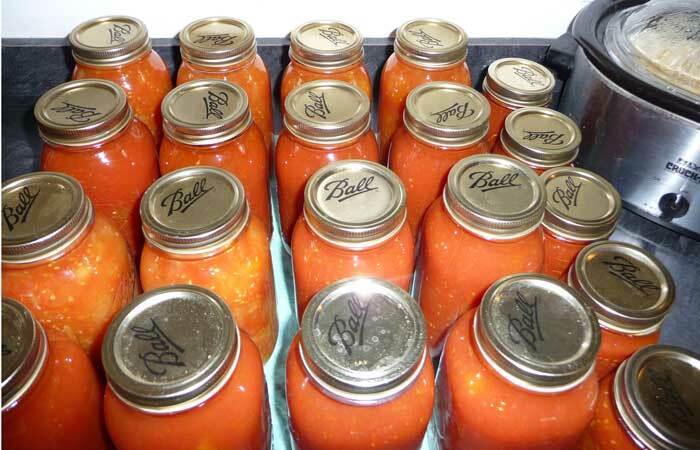 Today I canned a bunch more tomatoes. Some in simple sauce form and some are diced tomatoes. This is a very utilitarian straight forward kitchen skill, so one that went very smooth and I have several more jars of winter stash to show for it. 17 quarts and 5 pints to be exact. One of the few dishes that I feel I possess bragging ability is my corn chowder. Mom did show me how to make that, and I got a groove over the years with how I make it, which is a variation of Mom’s…my secret ingredient is a bit of nutmeg. It really expands the flavor. I made some corn chowder tonight, to bring to a potluck at a friends house. 5 mintues before leaving, late already, I realized I never put in the potatoes!! Chowder without potatoes! Crap. Well, too late to even microwave and throw them in, so off we go with my very literal CORN chowder. The extremely gracious hostess, unsolicited by me beyond telling her of my faux pas, grabbed a couple potatoes, microwaved and added them before we served, so that little catastrophe was averted. The chowder was very yummy and several folks commented to that effect. Yay! Not so successful was my attempt at “sun dried tomatoes” in the oven. I left them in too long and they are a bit crunchy, instead of that leathery feel they are supposed to have. I don’t know if they are lost or not, so I bagged them and will deal with them another day. Pesto was next on the list. I bought all the ingredients necessary to turn that basil into some fabulous pesto. The directions I found online indicated you could use a blender if you lack a food processor. I tried, not really that effective, so I made one batch and will see about borrowing a food processor to do the rest. It’s really too thick for a blender. I was able to mix up the first batch with a lot of hassle, and I’m too tired to really taste it tonight, but the small sampling I did have seemed adequate. Finally, for today, that sweater I’ve been working on. Not sure how I did it, but I misplaced my markers on 3 of the increases, at some point, so the increase lines are skewed. I need to pull out about 1/2 of the length, which is more than half of what I’ve knit so far, since it increases as you go. Very disappointing…and frustrating. So today had some ups and downs, but overall I’m happy that I forged ahead, and tried, even if it didn’t all end up glowing in the end. I started this morning early, well at least for me. I woke up at 8am, and went with my mom to the town library perennial sale. Mom got a wagon full of plants, and I went away with a modest basil and Iris. The basil is small and the Iris is just greens for right now, so not very photogenic. 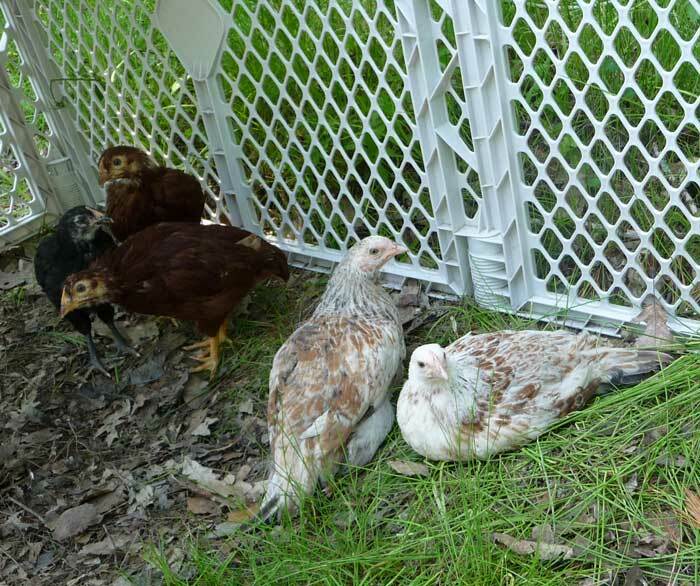 On the way home, to work on the chicken coop, I mentioned to my mom that my Dorking Hen that I was going to be getting from the Yellow House Farm, should be ready soon, as they would be old enough for sexing by early June. Mom decided we had time go see if she was ready today. I’m thrilled we went because Joe had separated the hens from the roosters last night! I got my pick of all the hens. It was a hard choice. The white dorkings were beautiful birds, but he had a couple that were bred with Sussex and they were incredibly beautiful. I decided I needed one of those two, but how to decide! When Joe pointed out since they were going in with the already established trio, it might be good to get two so they had buddies, and wouldn’t be the odd hen out. Great logic, so the deal was done! We had a delightful time looking at all the chickens, ducks, geese and turkeys. The farm specializes (all they do, really) in heritage breeds that have been risking extinction thanks to the invent of mechanized food production, who are more interested in birds they can fatten quickly. Both of the guys who own the farm are very friendly, knowledgeable, and excited about what they do and sharing what information they have. I’m excited about the Barrington Farm Tour that is happening on June 29. They Yellow House farm is one of the stops and I think the baby will love seeing all the birds. Upon arriving home dad and I worked on the Chicken coop (windows in, roof on, doors in process). I put all 5 girls outside together so they could meet in an area that has more to think about then the box they are in inside. Besides the original 3 have been inside for days, due to the rain, so they needed some fresh air. They all seem to be getting along quite well, a little pecking and charging, but overall they are happily coexisting. I think the decision to take both was a good one, as most of the day those two hung out on one side and the other three on the other side. I’m hoping to get some close ups of the new girls, so you can see their excellent coloring…maybe tomorrow. That is the mini tour, as they were the most photogenic today. I also picked up more tires today. Some for the second layer of the potato towers, as you can see the potato plants are getting big. Some will be for the garden addition…I’ve run out of planting space in the regular garden area and still want more! 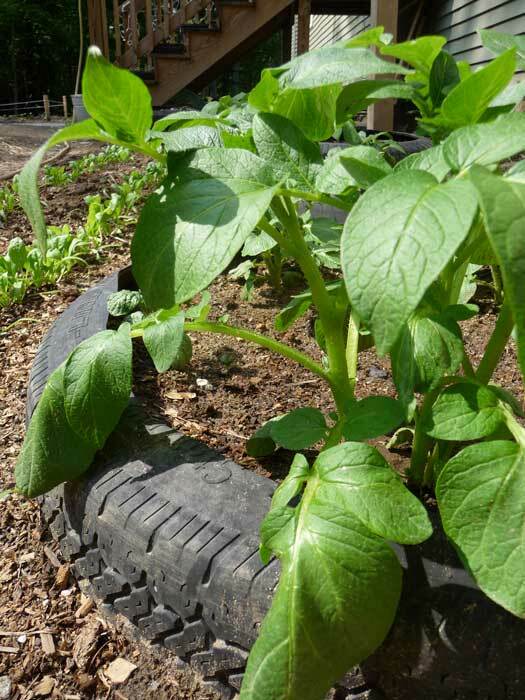 So tires as raised beds seems like a good solution.